Supermarket titan Sainsbury's is to launch a video streaming service later this year. 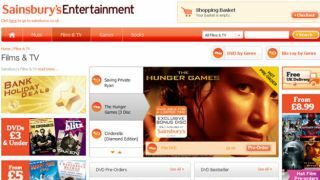 The Sainsbury's Entertainment portal will stock on-demand and digital copies of TV shows and movies on the day they're released on Blu-ray and DVD. The company has announced a partnership with the Rovi Corporation, which will provide the back-end support and licensing requirements for the offering. The store will be web-based initially, but will be rolled-out to connected devices like set-top boxes, Blu-ray players, smartphones, games consoles and Smart TVs soon after the pre-2013 launch. Sainsbury's Group Development Director Luke Jensen says on-demand video will complement the company's existing efforts in the entertainment sector, which already include an ebook and music store. He said: "On demand streaming video is an exciting addition to our existing online offerings, and supports our customers as they progress from consuming content on physical disc to accessing their favourite entertainment on a range of devices, where and when they choose." The announcement sees the supermarket follow its old rival Tesco into the on-demand video game. Last year Tesco snapped-up the Blinkbox service, while this year it added MP3 store We7 to its growing repertoire of digital entertainment properties.